Enjoy views back to Auckland, Beachlands and Maratai with stunning sunsets. Tirimoana looks across the water yet is a world apart. Ideal for couples and families - fully fenced and gated with a trampoline and parking for 2 cars and a small boat. Enjoy the complimentary use of unlimited fibre broadband and smart tv, including use of Lightbox, to keep your family entertained. 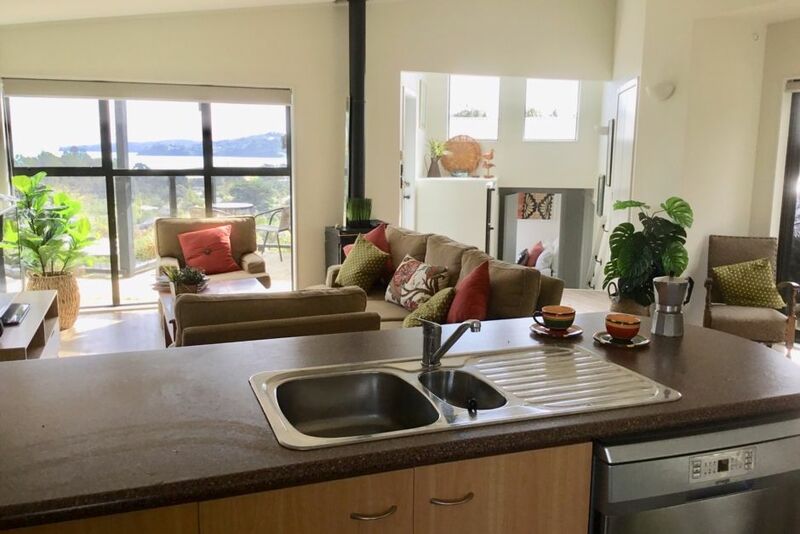 Tirimoana has a large and sunny open plan kitchen, dining and living area with 2 spacious bedrooms that can comfortably sleep 4 adults or a family of 5. - Fantastic indoor-outdoor flow opening onto 3 decked areas for more space to relax, all while keeping an eye on the kids on the nearby trampoline. - The kitchen has a large breakfast bar with 4 stools, a great focal point for family and friends. Tirimoana is newly redecorated and stylish throughout. The modern open plan kitchen, dining and living area open onto 3 decks enhancing the indoor-outdoor summer holiday living. Lounge and kitchen have 3 sets of bi-fold doors plus large windows that fill the room with natural light. - There's a large washing machine for your use and drying rack in the laundry. - Relax with a coffee - there's a coffee plunger and coffee stovetop moka for your use or head to the local cafe 5 minutes walk away. Everything is so close! Saturday markets, supermarket, many vineyards and beautiful beaches. Surfdale is a 5 minute stroll with a convenience store, fruit and vege store, French cafe and restaurant (during the day fantastic coffee and crepes and French restaurant at night), Irish pub and Italian restaurant (great pizza! Dine-in or takeaway). Ostend is a 15 minute walk to the supermarket, Saturday markets and bakery. All the Island vineyards and cellar doors are worth a look especially Stony Ridge, Tantalus, Cable Bay and Mudbrick. Suitable for children and infants - clip on highchair and portacot available, please enquire. No parties, large groups or gatherings. Waiheke on septic tank and rain water collection. Water is scarce on island, please be mindful of this. Please adhere to check in and check out times. An early/late check in/out could be available when surrounding bookings allow, please enquire. This is our family holiday home please treat with respect. Dining room table in open plan setting with kitchen and lounge. Very good accommodation, spacious clean child friendly. Great stay at a lovely house on a beauty island. Very good communication prior to he booking with a couple of great recommendations. Would definitely return. The property is well appointed and comfortable. Located in a peaceful area just away from the main roads, but very close to all main facilities. It is a light airy house which catches the sun through the day, but that means it can be very hot in the summer - air-con units in the bedrooms would make it perfect! Just a short way to the beach, but raised enough for sea views. Thanks for your nice review, so pleased you enjoyed your stay. Just so readers are aware - there is an air-con unit in the open plan living/kitchen/dining space and fans for each room. The Tirimoana home was absolutely beautiful -- clean, comfortable, bright, and spacious. The location was fantastic with a beautiful view, and our family of four could not have been happier. We spent Christmas in this lovely location and would love to come back again. Thank you so much for a wonderful stay! A beautiful home perfectly set up for a family! Thank you so much for allowing your home to be shared by others. We had a very relaxing stay and our toddlers loved the house and outdoor decking/trampoline area!! We highly recommend this house for a holiday and aim to come again ourselves. Thanks so much for staying and looking after our place nicely. We would love to have you and the family back anytime! Waiheke certainly is a slice of paradise. Beautiful, well kept property. Very clean and cosy. We enjoyed our stay so much we extended it. Would definitely go back.